Talk about an amazing Sunday! Mimosas, shopping, and meeting all of you ladies...it just doesn't get any better! 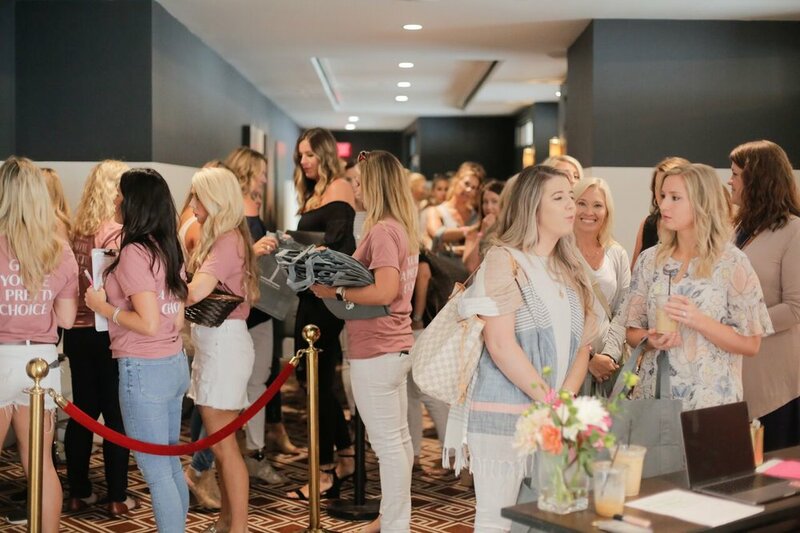 A few months ago, I knew I wanted to do something special not only to get you gals together in real life, but to also take this community of women that we've built and empower another group of women around us. And that's what we did!!! I had a feeling you ladies would show up to the party early. But 7:30AM?! That is dedication. I hope you stopped into Killebrew Coffee for a latte to hold you over until the sale began...love that place! It ended up getting so busy down in the lobby that The Thompson staff asked if we could move the line upstairs early. Amazing! And it worked in our favor because we were able to get you all checked before 9 so that when 9:15AM rolled around it was TIME TO SHOP! We had this huge meeting room set up with racks filled with clothing and tables around the perimeter filled with bags, jewelry and shoes. By the end of the sale, the gals in attendance had purchased all but one rack of clothing. ONE RACK! Let me paint the picture... we only had enough clothes left over to fill one small box. INCREDIBLE! 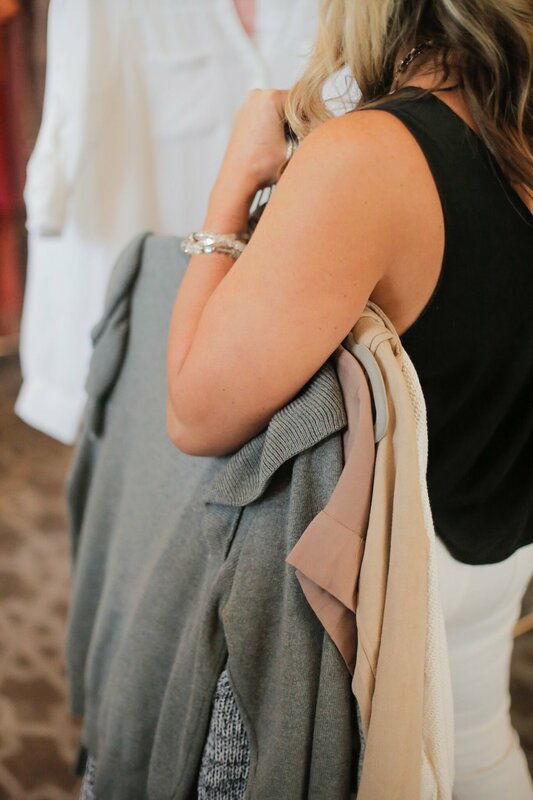 It's all in the details and I have to tell you about the AMAZING partners that made it so easy for me to make pretty choices in fancy-ing up this event! Printers Press did such a great job creating all of the signs, tags, & bags. Ali, he's the best in town! Natchez Glen House is truly one of the prettiest places I've visited in the Nashville area. They have gardens and gardens of different types of Dahlias and you pay $50 to fill up a white bucket with them. LOVE! Vroom Vroom Balloon put together the backdrop for all of the photos we took together. Do you just DIE?! They are beyond talented and I just want balloons in my life on the daily. I know you ladies had a ball posing for the camera in front of that masterpiece. LOVE them! Which brings me to Southern Style Photo Booths who set up shop and photographed us all morning long there. What's even cooler is that the booth immediately printed out the collage of photos... just like old times. 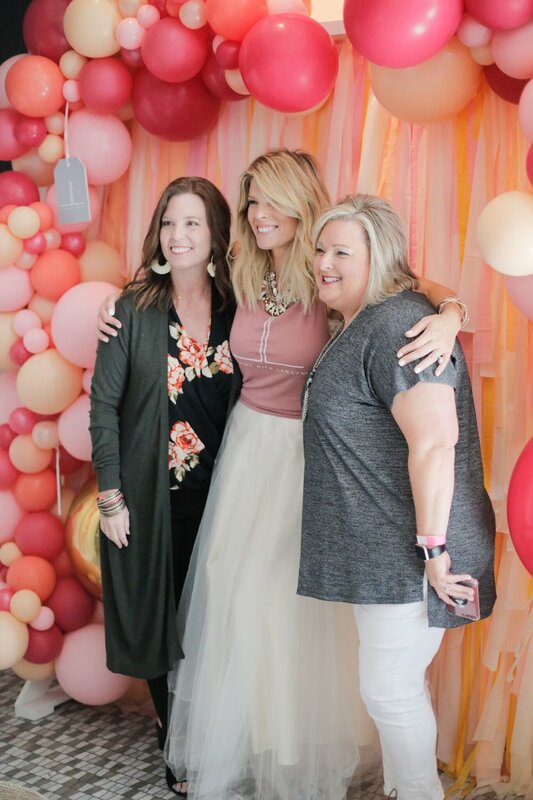 You're Invited is one of my go-to party destinations in Nashville. They have the best assortment of paper goods, invitations and gifts. If you haven't been, you must. UPS Store did such a wonderful job creating these giant cut outs of my head and other props we used in the photo booth, seriously... we had a blast with these things! And boy did we ever laugh. Living Proof Well, you know how I feel about some dry shampoo. If you don't....just know, I can't live without it. They were so generous to give every attendee a free full sized bottle of dry shampoo when they left. Talk about a party favor! Hemline is one of my favorite Nashville boutiques. Mary, the owner was so generous to donate many items that we could add to the sale. End of the season pieces that made so many shoppers happy. Brand new, tags and all. World Market for donating the tall leaning mirrors so that all the ladies could admire their new finds. Cathead Vodka + Perelada treated all the ladies to an open bar of mimosas and vodka + OJ. I mean, what's a little Sunday shopping without cocktails? Speaking of the photo booth, it was my absolute favorite part of the sale. As you all stepped up to introduce yourselves and take your photos, I was finally able to put faces to the Instagram handles I've been seeing everyday! We smiled, we hugged, hey we even broke into a few Landyn Shimmies too! Meeting each and everyone of you is truly the best. I love seeing your faces and having a moment to spend with each of you alone. You have no idea what that means to me. Brittany even traveled all the way from CANADA!!! I can't thank you all enough for coming together in support of helping the women of The Next Door. Whether you attended the sale or donated online, you were a part of this. I'm just in awe of this community of women. And with that said, I am proud to announce that items sold at the Closet Sale raised 6.7K. Donations from swiping up on IG Stories were 1K. And I wanted it to be a nice rounded number so together, we raised $10,000 DOLLARS for The Next Door!!!! If you still would like to support the event, you can donate by clicking here and putting LANDYN in the comment section. 100 % of the proceeds will go directly to the women of The Next Door. Cheers ladies, we did it! I'm so proud of us. I couldn't have helped these women alone.